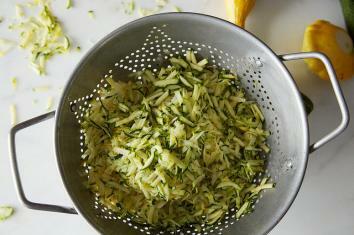 Waffled zucchini fritters: A recipe from Daniel Shumski's Will It Waffle?. 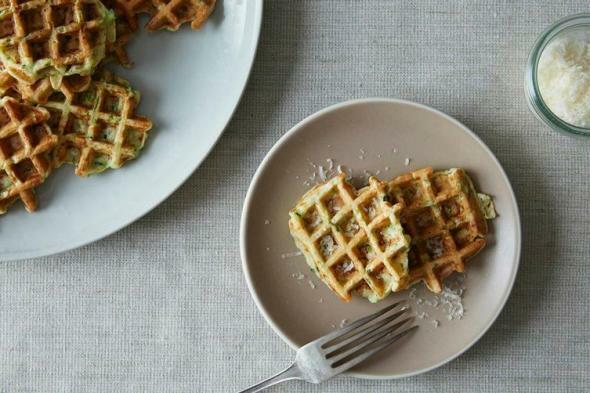 Yes, you can waffle zucchini. As Jane Austen famously said, it is a truth universally acknowledged that a food not waffled is a less tasty food. This raises a couple of questions: Why did Jane Austen hate pancakes? And how did she know about waffling everything before Will It Waffle? was published? I should explain. I have a friend, Daniel Shumski, who a few years ago, while completely sober, began sticking foods in a waffle iron to see what would waffle. (I assume everyone has a friend like this.) It turned out that Jane Austen was right. For example: Bibimbap: good. Waffled bibimbap: better. Or: S’mores: good. S’moreffles: better. I trust you are no longer sitting down. While he was writing a cookbook on how you, too, can waffle your kitchen, Dan came over and tried out his recipe for spaghetti and waffled meatballs. This was an event preceded by great excitement in our household, mostly with our then-four-year-old Isaiah, saying, Wait, we’re going to have waffles for dinner? and me saying, Well, sort of, and then Isaiah saying, Wait, we’re going to have waffles for dinner? and me saying, Well …. But the waffled meatballs were a hit and for a while afterward, Isaiah walked around the house thinking of foods that Dan should waffle. (I know, Dada! Bagels!) So did his father, actually. (I know, Dan! Pancakes!) I’m not sure whose suggestions were less helpful. The other day I inadvertently made actual waffles for breakfast and Dan’s waffled zucchini-Parmesan fritters for dinner. I had salad for lunch. I felt bad about not waffling it. I did not feel bad about waffling the zucchini-Parmesan fritters. And the children did not feel at all bad about swallowing them whole.